Notice anything different around here? I hope you guys like the new design, just as much as I do! I was craving a more simplistic look and I'm really happy with how it turned out. What's new? For starters, I updated the pages at the top which really should have been done like, two years ago. Seriously, I've got no excuses for that one. There is a Pinterest widget added in the right sidebar, which should make it easy to follow along with what I'm pinning these days. My instagram feed can now be found at the very bottom! There is a new type of "topics" section - you can click on any of the labels to find posts in that particular category. I added all the topics that I write about most often, so if you're looking for a certain post I'm hoping it's easy to find! You can also see that there are now popular posts and my favorite latest finds found in the sidebar as well. Please let me know if you see any problems/have any complaints about the new site - it's important to me that it functions well for you guys! Moving on - I've decided to start a new series of posts called Feeding The Littles! Inspired by my one and only little man...Camden! :) Ever since Cam has started eating real food (he wants all the food, all the time), it seems like I'm always trying to find creative meals and foods for him to try, otherwise I get stuck in a rut with feeding the same things over and over. I think it's really important to expose babies to a large variety of food, but at the same time I don't have a ton of time to be spending in the kitchen. For this series, I will share recipes that are all baby/kid friendly and that can be put together pretty quickly. For those of you without kids, these posts might not be helpful for you (unless you want to plan for the future) - so I'm sorry about that. I'm really excited about these posts, though, and hope that some of you will enjoy them! Chop veggies. In a large stock pot, heat 2 tbsp of butter or olive oil and saute the veggies, raw orzo, and salt for 2-3 minutes stirring continuously. Add the salt, water, and broth to the pot and cook over medium heat for 12-15 minutes, until the mixture thickens. This recipes makes a lot and is a perfect side dish for us adults too! You can also add chicken and cheese to this, which I plan to do the next time around. Camden absolutely loved it...he kept wanting more and more. It's great for lunch or dinner with some fruit on the side! He isn't using a fork yet so I just put small handfuls on his tray so that he could feed himself (he prefers it this way) but I also spoon fed him small amounts too. Yum yum! Thank you so much for the recipe! It sounds wonderful, and I am always looking for recipes for my family. 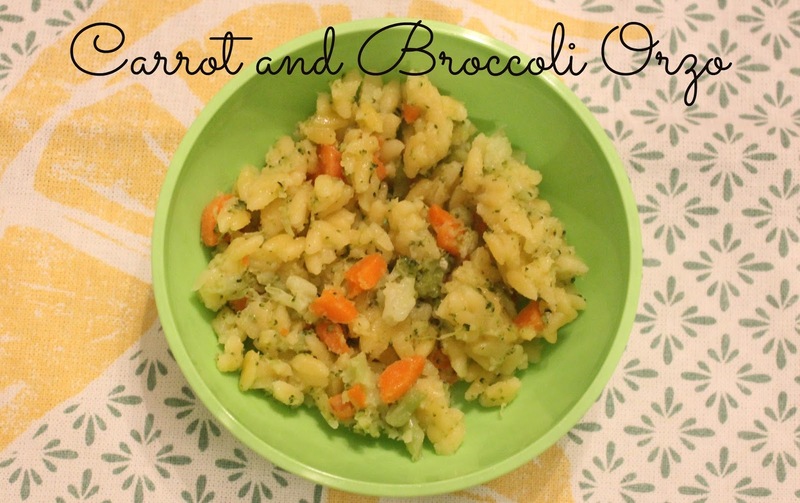 Totally making this recipe this weekend for my little guy! I've been in such a food rut with him so this new series of yours is PERFECT!! Thank you! Thank you! thank you so much for the feedback!! Hope your little man likes it! First, I LOVE your new blog design! I really need to clean mine up as well. And 2nd, I'm so glad you are starting this series! I have been struggling with new food to feed Cam! Pinning this! Feeding time is always a struggle for me! Pinned this! Super clean & crisp design! Love it! & Great recipe!! I've never cooked with orzo but, I wonder if changing out the orzo for quinoa would work? I bought quinoa the other day to start making with some of Jack's food but, haven't gotten around to it just yet! Love the clean new look sister! And love this recipe - Kenley and I could eat orzo at every meal.